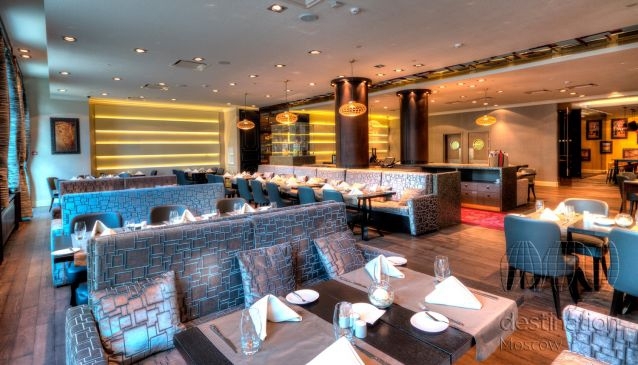 Town House Restaurant in Mercury Moscow Paveletskaya Hotel is an ideal place to have a taste of high cuisine, enjoy the best sorts of wine from all over the world, and simply spend time in cozy and sophisticated atmosphere. The designers of Town House Restaurant have made everything for those, who even swing by for a few minutes, feel themselves at home - at a big house with rich but modern interior. An old mansion, which was built here in the 18th century, and the newly constructed Mercury Hotel constitute parts of the restaurant, making it controversial and, along with that, attracting. Various rooms in Town House Restaurant, such as Dining Room and Wine Room, create such a typical interior scene of grand mansion of the past, accomplished with the portraits of former residents of Bakhrushina 11, a famous Moscow house of the 19th century. Thanks to each design element carefully thought over and implemented all the zones of the restaurant match and look harmoniously. And, of course, the fireplace, the hallmark of the restaurant interior, perfectly completes the design concept and gives a sense of warmth and tranquility. In Town House Restaurant, which provides 92 seats, everyone can find the place he feels most comfortable. The main idea of this restaurant was to gather famous dishes from all over the world 'under one roof', turning Town House into a real culinary treasury. Here you can definitely give full scope to your food preferences - distinguishes meals of Russian, Japanese, Italian, French, Moroccan, Greek, American, Chinese, Mexican and many other cuisines are served. The wide selection of wines gives you an opportunity to try a great range of flavors and choose the one that ideally matches your meal. The Wine Room makes boast of wine displays, a special glass cabinet and a tasting table. The restaurant often holds wine tastings with the participation of the best sommeliers. The come-hither glass vitrine with delicious pastry won't leave anyone indifferent. The restaurant is open from 12.00 am to 11.00 pm, serving its guests almost around-the-clock. From 7.00 to 10.30 am the guests of the hotel are offered delicious breakfasts full of vitamins, which give energy for the whole day.